Note that in Which Digital Channels Do B2B Buyers Use to Engage With Vendors? websites and email the most common digital engagement channels – which is why it is in both this chapter and that on that on email marketing … and chapter 9 – in the section that questions the ROI of marketing on social media. Half of Adult Email Users Still Use Their First-Ever Email Address. I have included A day in the life of... a B2B lifecycle marketing specialist to not only give you an idea of how email marketing works ... but what jobs are out there. How to use email marketing effectively. Email still public's preferred marketing channel, even after GDPR. According to Email Isn't Social Media, but It's Still Pretty Popular 50% of people prefer email as the contact method to receive an offer from brands. Top 10 Email Marketing Metrics. Many shoppers say marketing emails aren't effective on mobile focuses on shoppers, but the message is the same for all emails. Not only is email not dead - Marketers Clearly See Email As The Best Content Distribution Channel. Here's a question every student should ask ... What is a decent email marketing response rate?. A beginner's guide to email marketing automation. I've included A love letter to direct mail and its breakable rules for two reasons. Firstly it gives you an idea of how to be a bit different - but also as it is an example of someone who is a 'creative'. B2B emails: To HTML or not to HTML? Why I love Glossier's email marketing is interesting for a number of reasons. It shows how effective direct marketing emails can be … but also how it can be the opposite. Ultimately it is down to getting the message right for your target audience. Notice also how the case study organization [seems to] use the medium for income generation and branding – though note how some of the customers’ comments complained that the emails had no coupons. Within the article there is also a link to How Glossier Built a Beautiful New Product Email Campaign - which is worth a read if only to illustrate what is required for email campaigns such as those described. It ain’t cheap … never forget that ROI. You could reverse the findings in Brands: Avoid These Email Pitfalls into 'examples of good practice'. Some might say common sense. As my research takes me to a variety of websites beyond what a normal person might visit, the experiences of the author of How not to do sales emails (please stop stalking me) are similar to my own. And my reaction to iffy emails is the same. 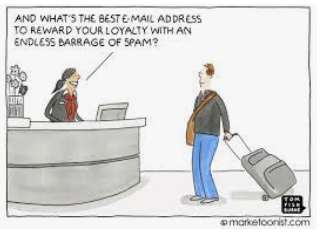 However, the message is the same to all email marketers. Five dos and don’ts for capturing customer email addresses on retail websites. 5 Steps to a Successful Email Drip Campaign. GO ONLINE *page 250* The boxes are ticked – but where is the fairy dust?. GO ONLINE *page 251* What a waste ... . The title of 20 automated emails your customers won't delete tells you exactly what the article contains. 7 Ways to Help Boost the Performance of Your Confirmation Emails. Get into the email automation game. In the book I include welcome emails in this section - 10 examples of welcome emails from retailers is a review of some. Note how some are quite aggressive towards sales, whilst others have a focus on building the brand – another example of how the ‘three objectives’ model can be applied. The State of Transactional Email. In Unlocking the full potential of transactional emails the author refers to 'transactional' emails, which are not direct marketing - as he covers in the article. 6 examples of perfect proactive triggered emails from Amazon, Airbnb and Stitch Fix. 3 UX Tips for Better Newsletters and Marketing Emails is a short video - it's about presenting content on emails ... but I think the same advice applies to websites. It’s time the generic retail newsletter is overhauled. In the book I associate newsletters with email as that is their method of transmission - but as alluded to in The New Social Network That Isn’t New at All they could just as easily be classed as social media. alancharlesworth.com. Simple theme. Powered by Blogger.